William Lewis Pritchard, aged 83 years of Moose Jaw, SK passed away on Saturday, February 2nd, 2019. He was predeceased by his parents, Lewis and Valerie Pritchard; and brother, Jack. 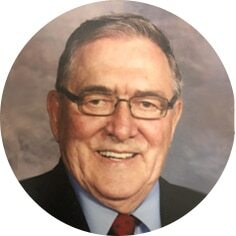 Bill will be lovingly remembered by his wife, Elaine; sons, Drew (MaryAnn) and Paul (Colette); grandchildren: Jared, Megan (Ryan), Grant, and Adrian; as well as many nieces and nephews. Bill was born in Moose Jaw, SK. He married Elaine Tremblay on April 15th, 1963. Bill worked with the CP Rail for 40 years, beginning in 1952 and retiring as an Engineer in 1993. He loved spending time enjoying the outdoors, most notably was his support for the South Saskatchewan Wildlife Association. A Memorial Service will be announced a later date. As an expression of sympathy, donations in Bill’s name may be made to The Moose Jaw Humane Society, Box 1658 Station Main, Moose Jaw, SK S6H 7K7. Arrangements are entrusted to Moose Jaw Funeral Home, 268 Mulberry Lane. Michelle Surtees Funeral Director 306-693-4550. To Elaine and family,I’m sorry to hear of Bills passing,myself and my staff always looked forward to his visits and his little but large to him problems.He was a customer that turned into a good friend,I will miss him. SO SORRY TO HEAR OF BILLS PASSING. We are very sorry to hear of Bill’s passing. Sorry to hear of Bill’s passing. He was a very special man, always helpfully and a great organizer. Our prayers and thoughts are with you Elaine. Elaine, I am very saddened to hear of Bill’s passing. I enjoyed seeing him regularly, and always looked forward to his stories of the gun club, skiing with the kids when they were growing up and the various antics he had been up to. He was such a nice man. You are in my thoughts and prayers. Deepest Sympathies in the passing of Bill , Kevin and myself always enjoyed chatting with him whenever we saw him at the gun range or the gun show.